Newly renovated and perfectly situated, Sheraton Grand Chicago offers a truly remarkable experience. The hotel is set in the heart of the bustling downtown district, along the Chicago Riverwalk; iconic attractions including Millennium Park, Navy Pier and the Magnificent Mile are mere steps away. Settle in to your intuitively designed room or suite, which boasts city, river and lake views; sink into our ultra-comfortable Sheraton Signature Sleep Experience, and make use of a spacious work desk, high-speed internet and a flat-screen TV. Our hotel is pleased to feature several excellent restaurants, from prime cuts of beef at Shula's Steak House to the laid-back Chicago Burger Company, open seasonally along the Riverwalk. 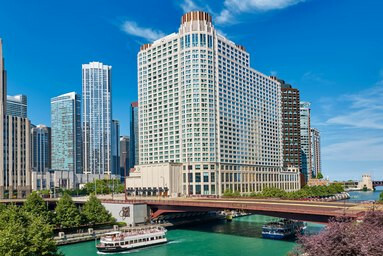 How to Book: To book your room, please identify you are part of the IQPC Intelligent Automation Chicago 2019 group to ensure the special rate (based on availability). The group rate is available three days pre and post event based on group rate availability. Please make your reservation before Monday, July 15th, 2019 in order to ensure you are eligible for the group rate. After Monday, July 15th, 2019, hotel rooms will be offered on a space-available basis at the prevailing rate. WARNING: Do not book your hotel accommodations with any third party vendors. In order to guarantee your room please book directly with the hotel. There are a number of fraudulent “third party providers” that will attempt to solicit you to book through their channel and neither IQPC SSOW nor the hotel is able to guarantee your room if you choose to do so. IQPC reserves the right to negotiate commissions or rebates from the venue in connection with the special pricing offered to our attendees. Details can be provided upon request.